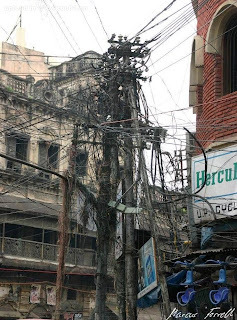 These photos are from India, where you call to get tech support. Have you seen the insides of MS Windows? I'll trust people who know how to make sense of those wires with making sense of the insides of MS Windows any day. Funny, yes, chaotic, for sure. 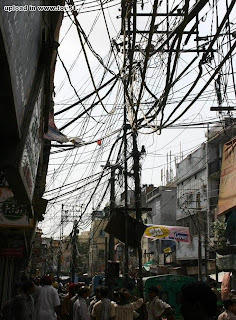 However, while we snicker, check out the number of fiber-optic cables in that mess — these people are loaded for bear, when it comes to bandwidth. A lot of people look, far fewer see. 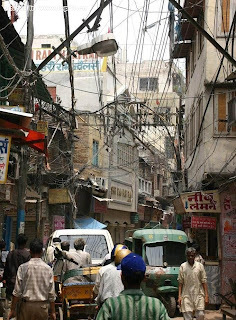 that was very mean, that place is chandni chowk in Delhi, its a market established 1650 AD, by the Mughal Emperor. the streets are so small that you cant repair/fix anything without closing it, which never happens.